This model of projector really stands out amongst all the “budget projectors” since it includes 3D, boasts onboard speakers, and is nearly small enough to fit in your bag, still is capable of amazing image quality. The black levels and colors are excellent, so the BenQ W1070 1080P will provide you with an amazing big-screen experience. This is a home entertainment projector meaning it is meant for family rooms or living rooms, as a supplement or a replacement for an HDTV for watching sports and movies. Given its intended location, this projector has to be much brighter than those home theater projectors, so it can stand up to that ambient light. This model is currently one of the highest-rated 1080p HD projectors on the market, and would be perfect for your home entertainment setup. This projector weights just 5.8 pounds, and measures 4.1 x 12.3 x 9.6 inches, so it is surprisingly light and small considering it is a 3D 1080p projector. In case you do not wish to install it permanently, it is extremely easy to store it somewhere when you are not using it, as well as to move it from one room to another, or even take it with you to your friend’s house. 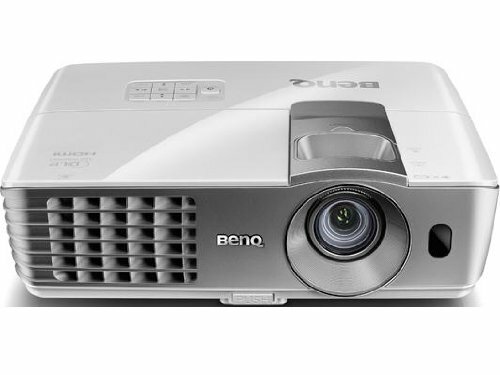 The back panel of the BenQ W1070 1080P 3D projector offers 2 HDMI ports, so it will be easy for you to connect it to two 1080p sources. Then, for component video, there is also a set of 3 RCA connectors, plus S-video, as well as the usual composite video and VGA ports. Compared to its predecessor, the BenQ W1070’s contrast ratio is doubled (from 5,000:1 to 10,000:1). Thanks to this brighter bulb, this projector provides greater depth of view and even more lifelike images. This projector boasts amazing resolution, perfect for gaming and Blu-Ray, since 1080p Full HD provides noticeably more detail than standard 720p HD resolution. You will now be able to see subtle detail in some wildlife documentaries, and much more; a whole new amazing depth of image actually. The closer you sit, and the larger the screen-greater the benefit. Boasting a brightness of 2000 ANSI, this projector does not demand a pitch black room in order to impress. It is bright enough to ensure a pretty decent picture quality, even during daylight conditions.